This page is dedicated to the frequently asked questions about the different basic first aid and CPR courses offered through major providers such as the workplace approved and Heart and Stroke Foundation. Which basic first aid course is the most intensive? 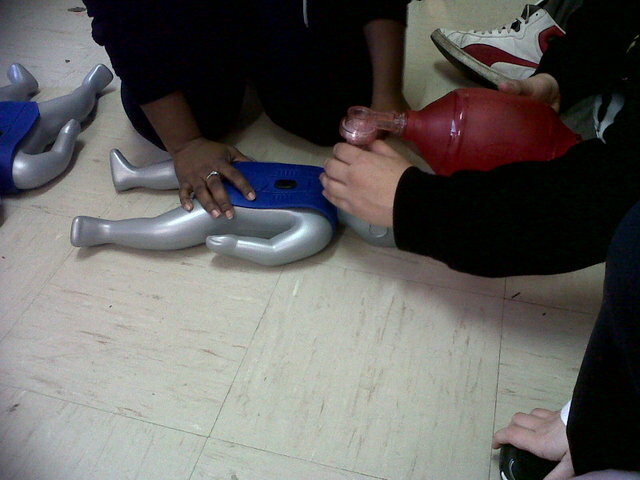 St Mark James’ emergency childcare first aid and CPR level “B” program is the most intensive program available. What is the highest level of CPR that I can get with my first aid course? Health care provider CPR, also known as CPR “HCP”, is the most comprehensive CPR training available. Candidates will learn to use bag-valve masks on infant victims in this course. Health care provider CPR (CPR “HCP”) is the highest level of CPR certification available. However, candidates for child care first aid do not have the option of selecting any other level of CPR other than CPR level “B”. How do I find out which course I need? Contact your employer or your school to determine which course you need. Standard first aid and emergency first aid are the most popular courses required for employee’s. Yes, a simple multiple choice test and a skills component is required to pass the course. A minimum grade of 75% is required. No, most people complete the test without any problems. What should I do to prepare for my first aid course? Contact your first aid training provider or training partner to determine if any pre-course assignment or homework is required. Wear comfortable clothes and shoes. You will be moving around quite a bit and working on your knees. Can the course be any shorter than the allotted time? No, instructors are required to teach the course according to the time limits imposed by the provider. Class size and experience will not change the length of the course. Definitely, first aid training providers do not supply candidates with food. Will I get a break in the class? Yes, instructors will provide breaks for candidates for snacks and lunch if needed.